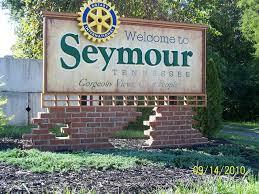 Seymour Tn is a non-incorporated city that encompasses parts of three counties,Sevier,Blount and Knox . It is a bedroom community of Knoxville and is located halfway between Sevierville and Knoxville . Many subdivisions dot the area as well as several shopping areas and physician offices. Convenience,and location makes Seymour a great area to call home.Home of the Seymour Eagles ,locals love to support their school sports.